The QHRC-15 Hot Runner Temperature Control System offers advanced features and control capabilities in a small package. Systems are available from 8 to 60 zones and stand at a maximum height of 32 inches. ADVANCED FUZZY LOGIC with PID algorithms provide precise and reliable control with accuracy of �0.5�F (1�C). The QHRC-15 features GLOBAL functions, set one, and then set all. 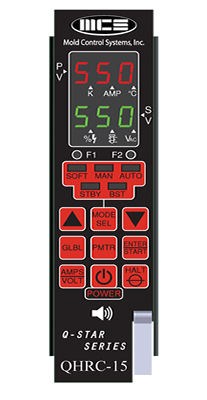 Main features include error detection, standby, boost, fuse protected TRIAC, fuse blown indicator, current and voltage display, even temperature rise, and thermocouple slaving. The QHRC offers advanced features unlike any other modular hot runner control. It is a full communication type control which features global functions that allow the temperature to be set on one unit, them sent to all the zones with the push of a few buttons. Modules can be placed in up to 4 groups for more flexibility. The communication feature of the QHRC series also provides the following capabilites: Even Temperature Rise, Thermocouple Slaving, and Live-Swap zone retrievable settings.